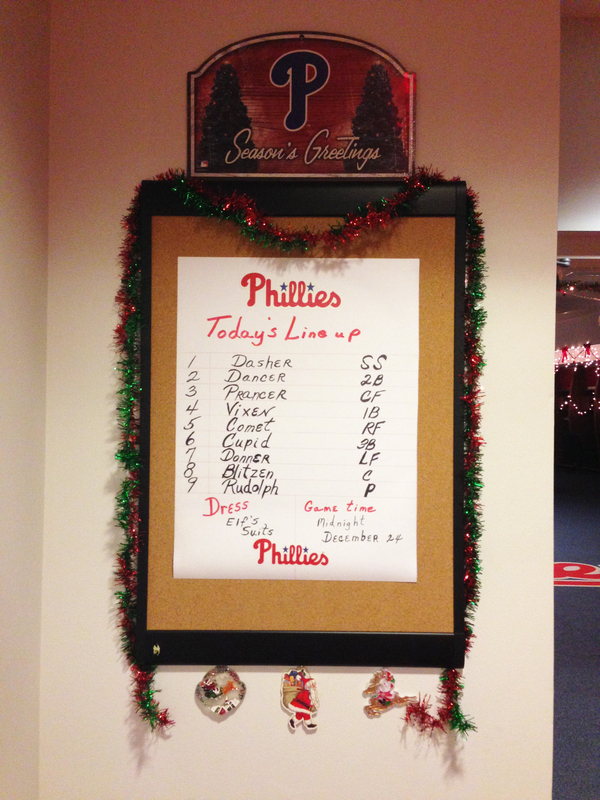 There’s an eraser board on the left wall as you enter the Phillies clubhouse. It is where the lineup for the game is posted early in the afternoon. The chore normally belongs to the bench coach. Right now the clubhouse is decorated for the holidays, lights, trees, snowmen and even an electric train. Question has been raised: Will Doc Halladay be added to the Phillies Wall of Fame? Well, the WOF eligibility rules stipulate a player has to have played five years with the Phillies. Doc wound up with four. (Managers and coaches need four or more years service). Then, in 2005 we added two more stipulations, position players needed to play in a minimum of 700 games; pitchers, minimum of 180. Idea was to make sure we had quality candidates. Should we make an exception? Will it open the famous can of worms? Should the number of years be reduced to four or three? Should the games played be changed or dropped? Who else then qualifies if the rules are changed? Should general managers an club presidents be considered? Yes, exceptions have been made since we started the WOF in 1978. The exceptions related to another rule that a player needs to be retired for three years before being considered. But, never the number of years in a Phillies uniform. 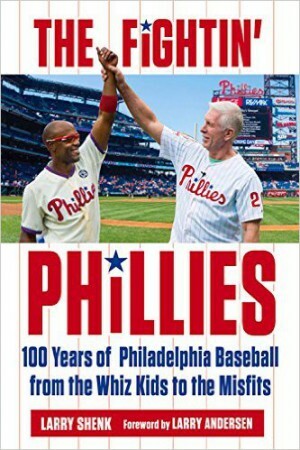 Exceptions have included Steve Carlton (1989), Mike Schmidt (1990), John Vukovich (2007) and Harry Kalas (2009). Lefty and Michael Jack were inducted the year after they retired. Vuk and Harry the K were inducted posthumously without waiting three years. To Bobby Cox, Tony La Russa and Joe Torre for being elected to the Baseball Hall of Fame. Next announcement relates to players and that will occur on January 9. Greg Maddux and Tom Glavine appear to be shoo-ins. This past July, the inductions included only deceased people. 2014 will be a huge weekend in Cooperstown. To Curt Schilling, who is taking the place of Orel Hershiser on the ESPN Sunday Night telecast team. Schill joins John Kruk and Dan Schulman. Poor Dan. To Lori and Scott Franzke who became parents of twin girls on December 6, Loretta and June. Son Gus and Scott are now out-numbered in the Franzke household. Ryne Sandberg will leave the winter meetings in Orlando later today for Philadelphia. He’ll take part in some of the Phillies Week of Giving Events next week. He’ll also be meeting with his coaching staff for a couple of days next week before heading for his Arizona home for the holidays. Ryne will be back east for a couple of weeks in January. Want a warm thought? Pitchers and catchers first workout is February 13. Recognizing the end is here is admirable and very difficult for athletes who are fierce competitors. Roy Halladay is one of the great competitors who dominated the game from 2002 through 2011. Citing back issues, he officially retired yesterday as a member of the Blue Jays, which is fitting. Congratulations on a great career, Doc. Equally important, thanks for all the thrills you gave Phillies fans in your four years in pinstripes. A World Series isn’t part of his resume. Other greats have experienced the same, including Jim Bunning. Jim’s a Hall of Famer and someday Doc will get there. There’s no higher honor than to be enshrined in Cooperstown. “I’m honored to be the very last out Roy Halladay got– 8,247 went down before me. Congrats to him on such an outstanding career.” Ed Lucas, Marlins first baseman. The record shows that Lucas fouled out in the first inning in Marlins Park on September 25, Doc’s final start of the season. Doc’s last win came against the same Marlins, September 17, 6-4, at Citizens Bank Park, 1 run in 6 innings, allowing 4 hits. 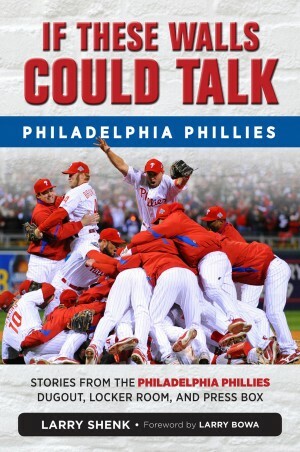 Many assumed they might be the final two starts for the Phillies. Little did we know. 203 wins, 105 losses, 3.38 ERA. 2 Cy Youngs. 2 no-hitters including a perfect game. Cooperstown numbers. What is your favorite holiday song and favorite toy as a child?